The Oil Capital Historic District is locally significant as the historic heart of Tulsa’s business community. The numerous examples of high-style architecture reflect a city and an architectural community in tune with national trends. The district resources document the commercial prosperity of Tulsa over a seven-decade period and showcase the evolution of nationally-popular architectural and urban design trends and architectural styles, ranging from the classical to the modern. There was probably no event more important in Tulsa’s history than the discovery of oil in 1901. At the turn of the century, the town had only about 1,390 residents. The first oil well, located in Red Fork, was just across the Arkansas River from Tulsa, and its location put the town at the center of an oil boom. The 1905 Glenn Pool strike enhanced Tulsa’s value as a business center where one could get leases, obtain bank loans, hire drillers, and find equipment for the oil fields. The city’s population exploded as newcomers wishing to partake of the riches flooded into the city. By 1920, the population reached 72,075 residents. Before the oil strike, Main Street was the commercial heart of Tulsa. Both north and south of the railroad tracks, it was lined with commercial establishments that served the basic needs of the small community, such as general stores, barber shops, jewelers, bakers, and meat markets. After the oil boom, a more vibrant, mixed-use downtown emerged, and commercial buildings were under construction along, and at an increasing distance, from Main Street. Oil companies, large and small, established headquarters in Tulsa. In 1910 Tulsa had just sixteen office buildings, and that number increased to ninety-three by 1916. By 1920, 431 oil and gas companies existed in Tulsa. The oil industry supported a culture of independent operators who ran their own firms in a decentralized fashion. Downtown buildings provided office space for the oil companies themselves, oil-related services, such as drilling, geological analysis, leasing, engineering, and for a variety of other professionals, such as physicians, dentists, accounts, attorneys and insurance companies. In 1915, Boston Avenue south of Fifth Street was almost entirely residential. However, the demand to displace houses with skyscrapers was inevitable. During World War I, Tulsa prospered as oil money washed over the city from supplying the war effort. The high financial returns of oil-related businesses were reinvested in larger oil companies and expanded refineries. After the war, the focus of new construction in downtown Tulsa shifted from Main Street to the vacant land along Boston Avenue south of Third Street. Wealthy oilmen wanted to build visual testaments to their wealth. They built along Fourth Street and Boston Avenue, one of the highest points in downtown Tulsa, and architects embraced the modern architectural style known today as Art Deco. South Boston Avenue was soon a corridor of prominent skyscrapers, as new modern buildings mixed with more traditional architecture to create a city of rich visual character. Banks that had started on Main Street also relocated to Boston Avenue during this period. 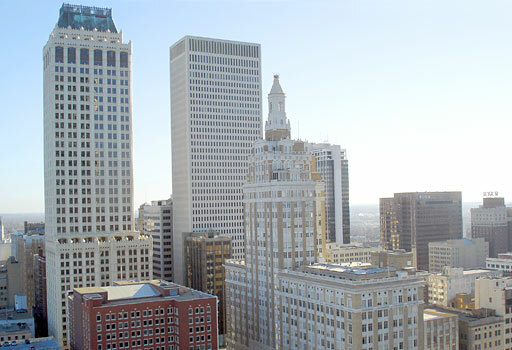 Of the twenty-four new buildings erected in downtown Tulsa between 1920 and 1929, twenty are in the Oil Capital Historic District. During the Great Depression, oversupply depressed the oil market and created difficult times for those whose income was dependent on oil, especially the working-class. However, 45 major oil companies and more than 500 smaller companies survived the Depression. The drop in oil prices curtailed building in Tulsa almost completely until after World War II. During the Depression, only four new buildings were constructed in the district, while only two new buildings were constructed during the war years of the early 1940s. When construction funds and materials became available after the war, the Oil Capital Historic District strengthened its position as the heart of the city’s business community. While the oil sector remained strong downtown, new industries and businesses outside the downtown area provided additional employment opportunities for many Tulsans. By this time commercial development had eliminated many of the historic residential areas in downtown Tulsa. As a result, new subdivisions were being constructed outside of downtown, and retail commerce followed. Communities across the country experienced similar trends, and Tulsa’s shift of retail activity away from downtown was one of the largest in the United States. This flight of stores from downtown to strip malls and shopping centers left the once diverse commercial activity of downtown Tulsa highly focused on oil-related business. Suburban expansion moved workers further and further out from the city core, increasing the number of daily commuters and exacerbating the city’s traffic and parking demands. A variety of solutions were employed to meet parking needs. Vacant parcels and empty lots where houses once stood were used for surface parking. Sometimes older buildings were gutted to provide indoor parking; or buildings were demolished to create parking lots. Fifteen large parking garages were built in downtown Tulsa between 1955 and 2005. The district includes five parking garages. The oldest and smallest is the National Register-listed K.C. Auto Hotel (1928). Development of the Oil Capital Historic District continued virtually unabated into the late 1960s. The character of the city continued to evolve, as buildings with large footprints replaced the dense conglomeration of smaller buildings built before the World War II. With the loss of retail activity and the addition of new modern office towers, by 1970, downtown Tulsa more closely resembled a suburban business park than the vibrant multi-use downtown it had been earlier in the century. In the early 1980s, overproduction of oil in other parts of the world and an accompanying national recession had a catastrophic affect on the petroleum businesses that remained in Tulsa. Oil prices declined nearly 50 percent when reduced demand accompanied the continued overproduction of oil. The result was a “bust” in the market between 1982 and 1987, and the oil industry continued to consolidate and eliminate jobs through the 1990s. Oil companies began to seek new oil reserves in the Gulf of Mexico, and they relocated offices to the Houston area, a city with a large technical labor force in an industry now much more knowledge-intensive. Today, the Oil Capital Historic District remains a testament to the oil men and the petroleum economy that fueled the city’s growth during the twentieth century. The density, massing, and design of the district distinguish this group of buildings from other parts of Tulsa, because it illustrates the evolution of the local economy, as well as the forces that shaped its development. The Oil Capital Historic District is readily identifiable as the historic center of business in Tulsa. The Oil Capital Historic District was listed in the National Register of Historic Places on December 13, 2010 under Criterion A for significance in Commerce. Its NRIS number is 10001013.